How Long To Pay A $10,000 Credit Card Debt If You Stick To Minimum? HomeBlog Credit Card DebtHow Long Will It Take To Pay A $10,000 Credit Card Debt If You Stick To The Minimum? How Long Will It Take To Pay A $10,000 Credit Card Debt If You Stick To The Minimum? There are several smart strategies to pay off credit card debt. However, sticking to the minimum payment is not one of them. In fact, if you have $10,000 on your credit card right now and you decide to stick to the minimum payment, it will take you more than 12 years to completely get rid of your debt. This is with the assumption that you will not add to the current balance. If you really want to aggressively pay off your debt this year, you need to pay more than just the minimum amount. Although this will keep you from defaulting on your debt and it will also keep you from being charged a late penalty, it can also rob you of your hard earned money. Sticking to the minimum payment requirement may seem like a good idea if your budget is tight. But if you think about all the money you will waste in paying the interest, you will think twice about this payment strategy. This is especially true if your card has a huge balance. According to CNBC.com, the credit card debt in 2015 grew to $917.7 billion. This was based on the report from the study conducted by Card Hub. Experts believe that rising debt levels is an indication of a strong economy. After all, people will not borrow money confidently if they cannot pay it back. However, if this is not managed well, it could lead to a lot of financial problems. The article revealed that most of the debt was accrued during the 4th quarter of 2015. This is to be expected since consumer spending really rises during the holiday season. While the behavior is expected, that does not mean we should take it lightly. Analysts are saying that consumers are starting to revert to their pre-recession habits. If something goes wrong again, people would go through another bout of financial crisis. The credit card debt growth in the last quarter of 2015 is actually scary because it is the largest growth since the Great Recession happened. These statistics should make you look at your own credit card debt. If you owe $10,000 on your credit cards and it has a 15% interest rate (the average as of 2016), sticking to the minimum will make you pay a very long time. You need to think about how you can bring down your balance so it will not cripple you in the event that an economic crisis occurs. And when it comes to being aggressive about your credit cards, you know that paying more than the minimum payment requirement is a must. To better understand the minimum payment, let us see how it is calculated first. The minimum payment is actually the smallest amount that you are expected to pay towards your credit card balance. Any amount lower than this is not considered as a valid payment for the current billing cycle. You will be charged with a late penalty fee and you will be in danger of defaulting on your debt and ruining your credit history. There are some cases wherein the minimum payment becomes the deal-breaker for benefits you are getting from the creditor. If you are enjoying a 0% or very low interest, failing to pay at least the minimum could forfeit this benefit. You can end up with a high-interest rate if you miss one full payment of the minimum. According to Nerd Wallet, there are various ways that creditors calculate this amount. However, there are 2 ways that they approach this calculation. Percentage. Creditors who use this approach simply calculate your minimum payment as a percentage of your total balance. For instance, if you owe $10,000 and the minimum payment interest if 4% of the balance, the minimum payment will be $400. Percentage + Interest + Fees. This is the more complicated calculation. If your creditor uses this approach, you need to consider a lot of factors about your credit card debt. Let us assume that you have $10,000 from last month and you failed to pay the minimum – which resulted in a $35 late penalty fee. Let us also assume that the minimum payment percentage is still 4%. 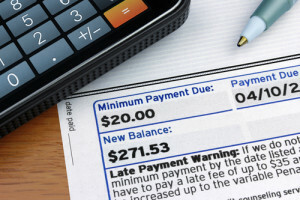 The computation of the minimum payment would be the sum of: $123 (interest charged on the $10,000 balance), $400 (minimum payment percentage of $10,000), and $35 (late penalty fee). That means your minimum payment for this month is $558. You can determine the minimum payment requirement of you look at the terms stated on your credit cards. You can also call the creditor to ask if they can divulge the information with you. By knowing how this is calculated, you can understand every detail of your billing statement. How much can you save if you pay more than the minimum? Now that you know how the minimum payment is calculated, let us know discuss how long it will take to completely pay off credit card debt if you only pay this amount each month. There are many calculators on the Internet but we chose the one from Bankrate. Assuming that you have a $10,000 debt and your credit card has an APR of 15%. Let us also assume that the minimum payment is 4% of your balance. If you stick to the minimum payment on your credit card debt, it will take you more than 12 years to completely pay off your debt. Take note that if you pay only the minimum, your payment will be $400 to start with and it will go down as you slowly pay off your debt. Over the course of that 12 years and 4 months, you will end up paying more than $4,400 worth of interest. This is all with the assumption that you will not use your credit card during the 12 years you are paying it off. In case you want to avoid spending that long to completely pay your debt, you can choose to consistently pay $400. That would mean you are paying only the minimum during the first month – but you will end up paying more after – since the minimum actually goes down as you continue to make payments. This strategy will help you pay your debts in 2 years and 7 months time – almost 10 years earlier compared to sticking to the minimum payment requirement. As you notice, paying more will help you get bigger savings on your credit card debt. You need to work hard to contribute as much as you can towards your credit card payments. It will be harder to pay more than the minimum if your balance is bigger. But if you are consistent with your efforts, you will eventually pay off all your debts. Do not believe the minimum payment trap because it will keep you in debt far longer than necessary. Not only that, it will make you pay more on the interest. Here are some tips that will help you pay more than the minimum of your credit cards. Get one expense off your budget and put it towards your credit card debt payments. It may be that subscription that you are not using. Or you can choose to brown bag your lunch every other day. Any sacrifice should be worth it if it means you can get out of debt faster. Use any windfall to pay off your balance. This can be a holiday bonus or your tax refund. Any windfall that will not affect your monthly expenses should be used to pay off your balance. Declutter your life and sell what you are not using. Any profit that you will get from this sale should be paid towards your credit card balance. This will not only help you organize your home, it will also help you deal with your credit problems. There are other things that you can do to help pay more than the minimum of your card. Make sure you manage your credit card debt as soon as you can. That way, you can liberate your finances so you can use it to improve your net worth.